According to recently released Symantec’s Internet Security Threat Report (ISTR), 2013 was the year of the mega breach in security world. There was a 62 percent increase in the number of data breaches from the previous year, resulting in more than 552 million identities exposed. The report said that attackers are not only growing more and more sophisticated but they are also getting more patient and waiting to strike until the reward gets bigger and better. 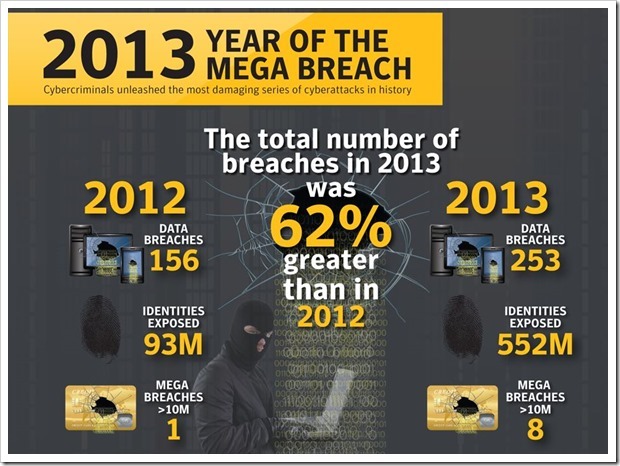 In 2012, the total number of breaches were 156 and total identities exposed were 93 million. In 2012, the number grew to 253 and 552 million respectively. Hacking continued to be the primary cause of data breaches in 2013 and and accounted for 34 percent of all the data breaches. Among the type of information breached; Real names, birth dates and Govt ID numbers (SSN) we the most compromised data types in 2013.
in 2013, with 70 percent of spam was related to adult content. Email Virus rate also grew in 2013 with 1 in every 196 email being a mail having a hyperlinks or attachments that carried malicious code. In 2012, the same rate was 1 in 291 emails. 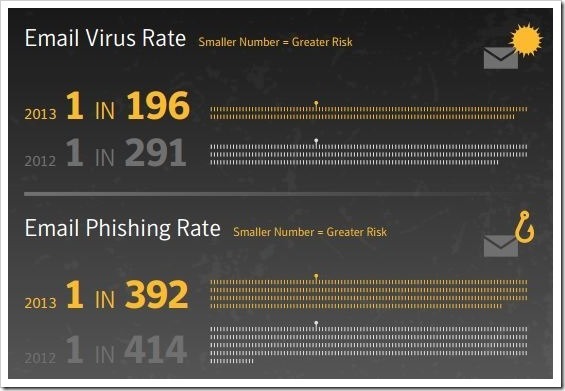 Also, 1 in 392 emails were phishing emails (sending users to malicious page using hyperlinks). In 2013, mobile malware came down compared to previous year, as mobile owners seems to have got smarter. Total Android mobile malware variants came down by 14 percent to 3262 in 2013, compared to 3783 in 2012. Total mobile vulnerabilities also fell from 416 in 2012 to 127 in 2013. Check out the video below released by Symantec in regards to their Internet Security Threat Report for this quarter. You can download the entire report from here.